It is like the camera in the Twilight Zone episode “A Most Unusual Camera,” but it has an even more sinister backstory. Once owned by a serial killer, it develops pictures that foretell grisly deaths, including that of a PTSD-suffering war photographer’s wife. Suddenly, Jack Zeller must scramble to arrange for substitute victims. Of course, that sort of makes him a serial killer too in Aaron B. Koontz’s Camera Obscura (trailer here), which opens this Friday in New York. Zeller’s last assignment really messed him up. To get him back on the horse, his wife Claire gives him a vintage German camera and arranges a gig taking photos of her company’s latest real estate development. Somehow, he manages to find a photo developer still in business (you’d think a pro like him would have his own darkroom facilities, but whatever). However, his pictures turn out a little funny. For some reason, the color film prints in black-and-white. Several shots also depict gruesome death scenes he surely would have noticed at the time. Of course, each sinister photo soon comes to pass. The first are merely accidental deaths, but they become increasingly gory. They also start to feature Claire as the dead body, but Zeller discovers he can replace his wife in the photos by killing another victim in the same place and manner. He tries to pick replacements who have it coming, but his substitute killings really get complicated when the cops start to suspect. Christopher Denham’s moody brooding is almost too much of a good thing. It is hard to imagine living with Zeller after a while, but during the first act, he and Nadja Bobyleva’s Claire make an appealingly down-to-earth everyday-people-looking couple. Genre regular Noah Segan (The Mind’s Eye, Redeemer) also brings a lot of attitude and energy as Zeller’s best friend, Walt. Plus, Catherine Curtin and Chase Williamson (SiREN, Beyond the Gates) provide a credible foil and the voice of reason, as the “bad cop” and “good cop” dogging Zeller. A horror film structured around uncanny photography had better look right, but fortunately cinematographer Chris Heinrich gives it an eerily effective shimmer of mystery. 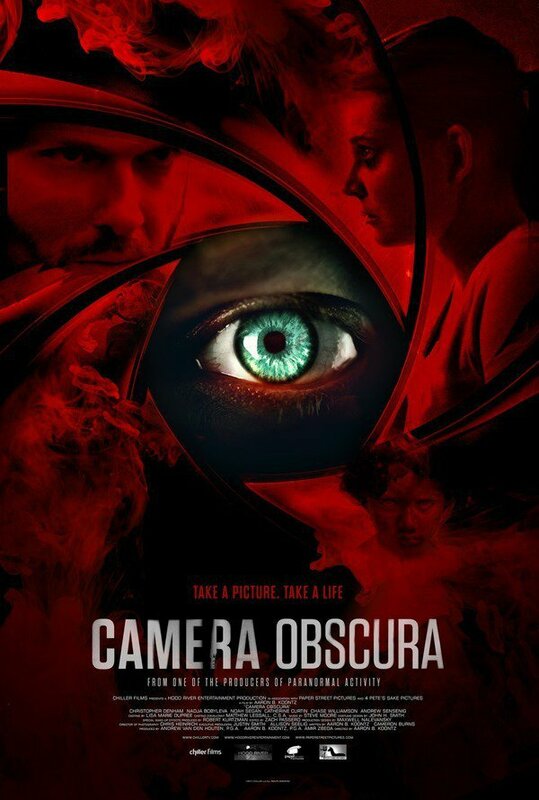 Visually distinctive and well-cast (especially in its supporting roles), Camera Obscura is quite a promising debut from Koontz. Recommended for horror fans, it opens this Friday (6/9) in New York, at the Cinema Village and in LA at the Arena Cinelounge Sunset.